There are two old Danish West Indian photographs available at the Danish Maritime Museum that are some of the oldest photographs extant from St. Thomas. Taken at the same time, these daguerrotypes were meant as a panorama featuring the town of Charlotte Amalia and the harbor of St. Thomas. Hans Hansen (1819-1882), Chief Pharmacist at A. H. Riise Apothecary in St. Thomas, photographed the scene in the early 1850’s. He was well suited to the relatively new art of photography. His position as a Pharmacist gave him the background knowledge of Chemistry and the ability to order chemicals and equipment to be shipped in from Europe. This view of Charlotte Amalia on a sunny morning was taken from atop Blackbeard’s Castle and looked towards Denmark Hill and the western part of town. There were no houses in Frenchtown and, while hard to tell in the panorama, Hassel Island was still a peninsula attached by a sandy haulover at that time. The photographer had his view camera on a large tripod to make an exposure that would have required a few seconds. He then turned the tripod, without changing the height, to get the other part of the view. I matched up the two different photographs creating this panorama. There was no way to easily replicate Daguerrotypes as there were no negatives. The photographs were taken back to Denmark to be reproduced by lithography. This was a printing technique which involved the artist drawing in wax on a polished stone which was then etched. The stone was then inked to print copies of the picture on paper. Being less expensive than an original painting or photograph, the lithograph allowed more people to have art hanging in their home. The scene in the photo on the right was made into a lithograph by A. Nay and printed by C. E. Bærentzen. The lithograph could then be printed en masse in black and white and hand-painted to create a color version. I remember Isidore Paiewonsky used to have an original color version of this very lithograph displayed at his house on Dronningensgade on Blackbeard’s Hill. The lithograph was also featured in a large volume entitled Danmark published in 1856. 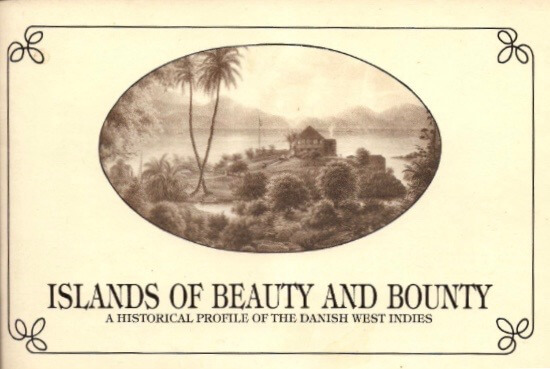 The book featured a section about the Danish West Indies which Nina York translated and reprinted. 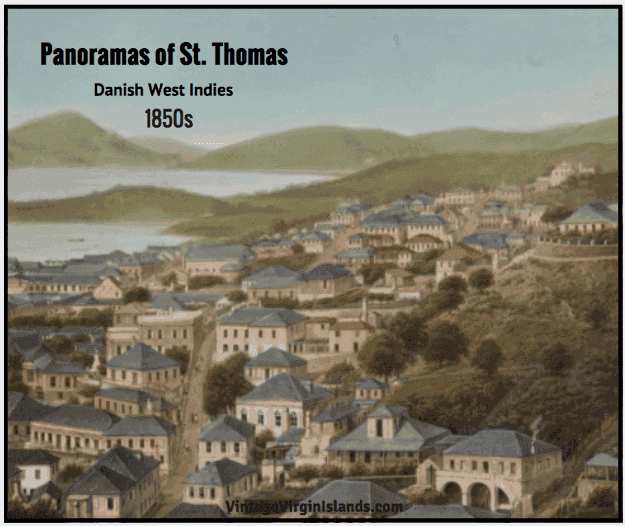 This section featured six lithographs which included this specific lithograph titled St. Thomas – the Western Part of Town. This picture takes us into the heart of town, and we receive from the handsome, well kept buildings the impression of a somewhat irregular, yet beautiful, clean and prosperous town. I found an advertisement for a showing of panoramic view photographs at the Commercial Hotel (Grand Hotel) on St. Thomas in November 1859. The programme for the show included a General view of St. Thomas. While the Hans Hansen photographs and lithograph demonstrate the appeal of panoramic photography, they are very important historically. They transport us back to a vibrant, mid-1850’s St. Thomas when commerce was flourishing and interest was growing in this genre. It became the precursor to Lightbourn’s historical postcards which are still popular today, more than one hundred years later. Copyright © 2017 Dr. Dante Beretta. All Rights Reserved. Thank you to Maritime Museum of Denmark, The Collection of Prints and Photographs for the image of the daguerreotype of the harbor of Charlotte Amalia.